When this question comes up in conversation, I usually answer it with “No, not really. Well, sort of. I mean, I’m not good, but I can kind of play piano about this much.” I hold my thumb and forefinger an inch apart to demonstrate how small my musical accomplishment really is. When I was in grade school I became fascinated with the two pianos in our school – one in the auditorium and one in the music classroom. I remember the day the music teacher let each of us in turn practice a middle C scale. And that’s about all I recall from music class in my elementary years. 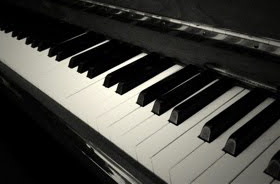 Mostly, I remember daydreaming about playing the piano in the auditorium when we were stuck in a boring assembly. A couple of times in fifth grade, when my class was supposed to be working on sets for a class play, I snuck over to the piano and started pressing keys simply to hear the sounds. I don’t know why, growing up in a house where Hank Williams was considered a deity, I developed a liking for the sound of the black and white keys. Maybe it was a form of rebellion, since a keyboard is seldom used in country music, or at least not the country music my parents favored. I’m not claiming to be high-brow in my musical tastes. I like me some pop music. But especially when that pop music heavily features keyboard of some kind: Elton John, Carole King, Stevie Wonder, Bruce Hornsby, Coldplay, Lady Gaga (yes, even though I’m thoroughly ensconced in my middle-aged years; I try to concentrate on the music and not the meat dress or whatever.) I’ve always kind of wished I knew more about music, but didn’t know how to go about learning. My dad had a guitar and a fiddle that he’d picked up used somewhere, and he taught himself to play. But he wasn’t one to let kids mess with his stuff. And paid music lessons in my childhood were as realistic a possibility as a trip to the Antarctic. I signed up for band class when I went to junior high. I played clarinet because I had to use a school instrument and took what was available. I did learn some about reading music and my ear got trained a little, but let’s just say clarinet was not my destiny. For years I stuck with playing the radio, the daydream of piano hovering in the back of my mind, surfacing occasionally. It wasn’t so much that I felt deprived over it not happening in real life, but that I enjoyed having a fun little fantasy sometimes. My daughter stuck with lessons for six months, then decided to pursue other interests. But my son – let’s just say piano does seem to be his destiny. After a couple of years’ time, he’d passed me right up. I couldn’t keep pace with him. When he was 10, my mother-in-law and sister-in-law pooled their money to buy us a new piano, and he was in heaven, using an instrument that sounded the way it was supposed to. By the time he was 11, he was choosing Philip Glass pieces to play in recital. He’s 15 now and not only still plays, but also owns a MIDI keyboard he keeps plugged into the computer so he can compose and record his own original music. Meanwhile, I’m still plugging along, inch by inch, through children’s lesson books, supplemented with YouTube tutorials. My practice has fallen by the wayside a couple of times, for periods of a few months, but I keep coming back to it. When I say inch by inch, I mean my progress is soooo slow, and by slow I mean think in terms of those drops of pitch that hung suspended for many years before finally falling in that Australian study. For one thing, I can only squeeze in 20 minutes or so of playing, about three or four days a week. After nine years, off and on, I’m finally at the end of the fourth instruction book. I no longer have any pretense that my playing has anything to do with encouraging or assisting my children in any way. I know I’ll never be good, really, and I have no desire to try to perform for anyone else. My fingerwork is too staccato, and unlike my father and my son, I don’t possess an innate ear for the notes . But I’ve learned more about music, which means I get more out of the music I listen to. Plus, playing an instrument is supposed to help your brain function. My brain will take all the help it can get. And I enjoy it so much, those little 20-minute sessions of daydream fulfillment. So yeah, I play piano now. Kind of. A little. Update: I know there was rampant speculation about what outfit I’d select for the after-party. Breaths were held as everyone wondered what it would be. Would I choose flannel or fleece? Even I hadn’t decided until the very last second. But fleece won the night. The gray hoodie I’m wearing right now was designed by…um…someone who does marketing for Mark Twain Cave(?) I guess. While the t-shirt underneath harks back to the era when I was on a softball team. The jeans were chosen specially for this occasion because they’re loose enough to allow an extra layer underneath. My jacket is a family heirloom, passed up from son to mother. And the blue fingerless gloves are meant to send a message about the weather.